When you need fast, affordable, and reliable air conditioning service and repair in Van Nuys, Calabasas, Glendale, or any other nearby city, you can count on Zodiac Heating and Air Conditioning, Inc. We are a locally based, licensed HVAC contractor with more than 10,000 satisfied customers across San Fernando Valley and the surrounding region. We have 30+ years of experience and an excellent reputation for providing high-quality air conditioning service and repairs at a great price. Our superior service has earned us the prestigious Carrier President's Award. Because temperatures in the San Fernando Valley frequently reach the mid-90s during the summer months, your air conditioning system is more of a necessity than a convenience. That's why, anytime that we get an AC repair call, we at Zodiac Heating and Air Conditioning look to get that system back up and running as quickly as possible. We offer convenient appointments Monday through Friday and provide a 24/7 answering service. 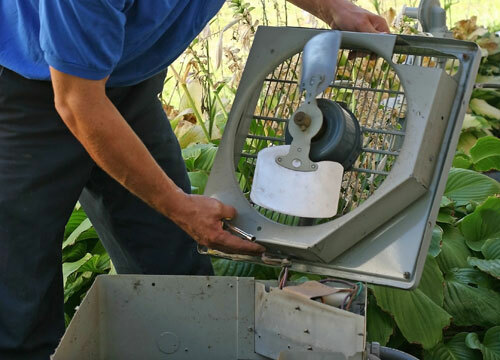 Our highly trained and experienced, NATE certified HVAC service technicians are exceptionally qualified to repair and service all major makes and models of air conditioners, including but not limited to Carrier, Trane, Lennox, Goodman, Rheem, and Day & Night. They'll arrive in uniform with a truck that is fully stocked with the state-of-the-art diagnostic tools, the industry's best service equipment, and frequently needed replacement parts, such as compressors, capacitors, sensors, contactors, and more, so they can accurately diagnose and fix the vast majority of air conditioner issues on the first visit. Included in every service visit is a thorough check of the entire air conditioning system. This ensures that nothing is missed and that we give you the best possible recommendation, whether that's a low-cost parts replacement or investing in a new, high-efficiency air conditioner. If you are located in Van Nuys, Calabasas, Glendale, Santa Clarita, Simi Valley, Tarzana, Valencia, Santa Monica, or any other nearby city, contact Zodiac Heating and Air Conditioning, Inc. today to schedule an appointment for AC troubleshooting and repair. Before we begin any work, you'll be given an upfront, flat-rate quote that includes both parts and labor. Even if the job takes longer than expected, we'll honor our quote. Our prices are very competitive, and we stand behind the quality of our work with a 90-day parts and labor warranty. Additionally, if you are a Maintenance Member, you get priority scheduling and a 15% discount on all repairs.